Identify and compare the various smart glass technologies and describe their typical uses in commercial applications. Explain polymer dispersed liquid crystal (PDLC) technology and discuss its use in smart glass products to provide privacy, comfort, and design solutions. Define the various applications where switchable privacy glass and film can be used in interior settings. Discuss standards and codes as they relate to smart glass products, including switchable privacy glass and film. Describe the sustainability and energy use benefits of smart glass technology in commercial applications. As the smart glass industry rapidly expands, more and more architects and designers are getting smart about how to use this state-of-the-art technology to enhance a wide range of commercial projects. Switchable privacy glass, in particular, which uses a liquid crystal technology known as polymer dispersed liquid crystal (PDLC) film, can provide users with greater privacy benefits than other traditional methods—and even other smart glass technologies. This PDLC technology, which is sandwiched between two layers of glass and two layers of conductive interlayers, allows for the visual appearance of the glass to change from opaque to clear (or to dim settings in between) with the flip of a switch. Photos courtesy of Polytronix, Inc. This newly updated executive conference room utilizes PDLC smart glass technology for on-demand privacy with the flip of a switch. Over the years, the glass and window coverings industry has evolved from curtains to blinds to integral blinds/roller shades (manual and automatic). Now, as an offshoot to this market, there is smart glass—an innovative option in that it is more like an electronic device than more traditional products. In this course, we will look at the various benefits accorded to interior commercial applications by the use of electronic switchable privacy glass and how this technology has revolutionized the way people look at their privacy options for windows and doors. In the most basic terms, smart glass is glass that varies its light transmission properties under light, thermal, or electrical influences. 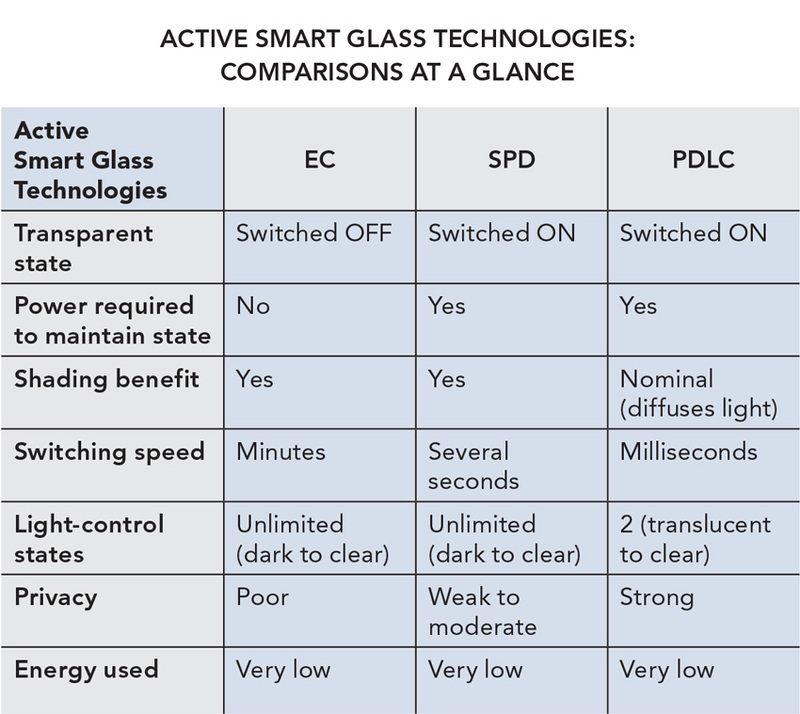 There are two general categories of smart glass: passive (light, heat/natural) and active (electrical/on demand). In the passive category, there are multiple subcategories, including thermochromic and photochromic (transition lenses). In the active category, there are three subcategories: electrochromic (EC), suspended particle devices (SPD), and polymer dispersed liquid crystal (PDLC). Passive smart glass technologies are those that use natural, nonelectrical stimuli, such light and heat, to transition from dark to light. They cannot be controlled manually. These include thermochromic, which reacts to heat, and photochromic, which responds to light. Photochromic: Photochromic materials will change level of transparency in response to the intensity of light. The most typical use of these materials is in eyeglasses that change from clear to dark based on whether the wearer is in dim indoor light or in bright outdoor light (i.e., transition lenses). Active smart glass technologies are those that respond to an electrical stimulus, which allows them to be controlled by the user, providing on-demand results. Electrochromic (EC): This material can switch its color by the application of an external DC voltage or current, using electricity to turn the glass from clear to dark. Typical use includes solar control for exterior glass. In the darkest state, the visible light transmission can be less than 3 percent. Shading offers limited privacy as it can still be seen through. Suspended particle devices (SPD): These are small light-absorbing microscopic particles (aka light valves), which allow windows to go from clear to dark in a matter of seconds in response to an external AC power source. When voltage is applied, the suspended particles align, allowing light to pass. This technology is generally used for light-control applications—most commonly auto glass, skylights, sunroofs, as well as portholes and marine and aircraft windows. It provides weak to moderate privacy. Polymer dispersed liquid crystal (PDLC): This innovative liquid crystal technology switches from opaque to clear in milliseconds using AC power, regardless of the window size. It has light-scattering power, which can be adjusted by applying an electric field, and can be used for a range of interior and exterior applications. Products using this technology are available in a self-adhesive switchable film that can be applied to existing window surfaces as well as a laminated switchable glass. In its opaque state, it provides total privacy—that is, it cannot be seen through. PDLC is not a glass-based technology but rather is film based. The optical clarity will be similar but cannot be identical to regular float glass, as it contains liquid crystal materials that optically manipulate light. It is an electronic device and cannot be subjected to extreme environments like glass can without the proper protection. It is not made with a single pane of glass but instead with two panes of glass, making it a laminate. If you’re looking for full privacy benefits and speed, you would choose PDLC products over other types of smart glass, as PDLC is a true privacy solution.